Having spent the morning enjoying a second landing in front of the glacier, Tunabreen, we all got back on board the ship ready to head north. Unfortunately the weather was not in our favour with strong winds preventing us from making our journey north. With our plans scuppered the crew instead sought out a location for us to make land for the afternoon. We were boat bound for a good couple of hours across the middle of the day as we sailed in search of a location to make a landing. 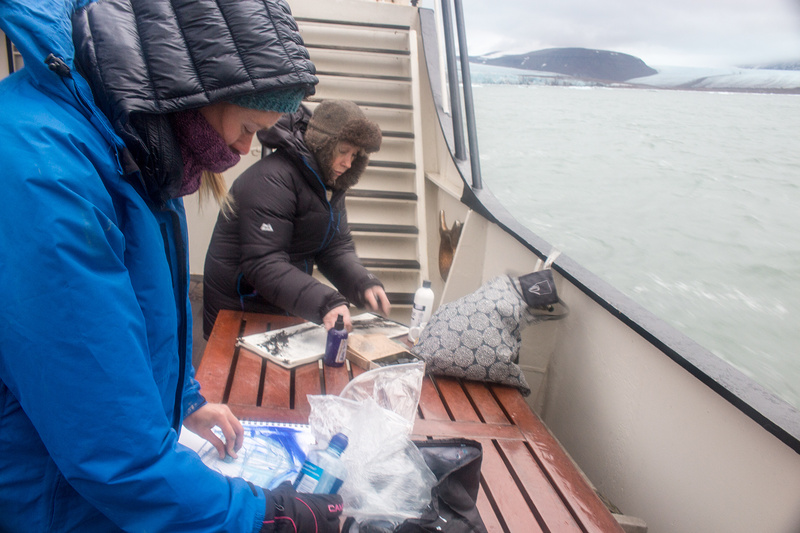 My fellow explorers Ellis O’Connor and Janette Kerr, both landscape painters, set themselves up with a makeshift ‘studio’ on the deck of the ship. They set about vigorously recording the passing landscapes with charcoal, pencil, and watercolours amongst other things. 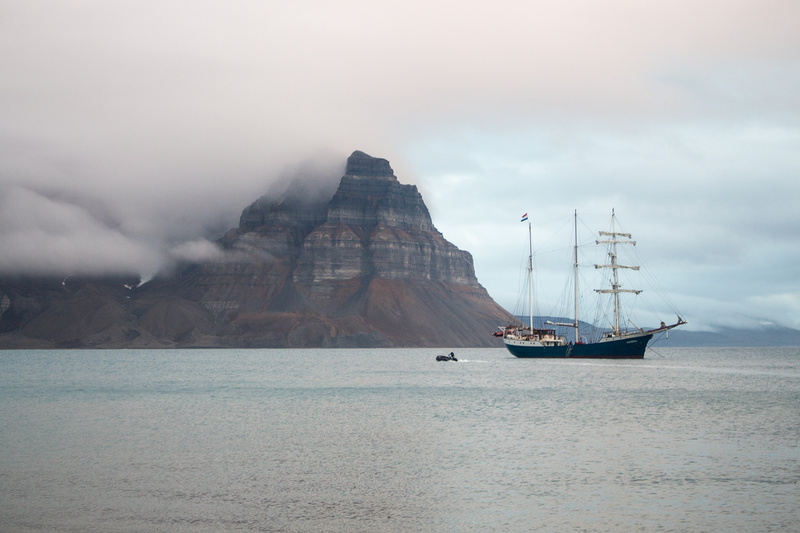 The geology of the mountains that we sailed past was astonishing. The layers of rock were so clear and distinct. The mountains looked magnificent as the clouds enveloped them as in the photograph at the top of the page. 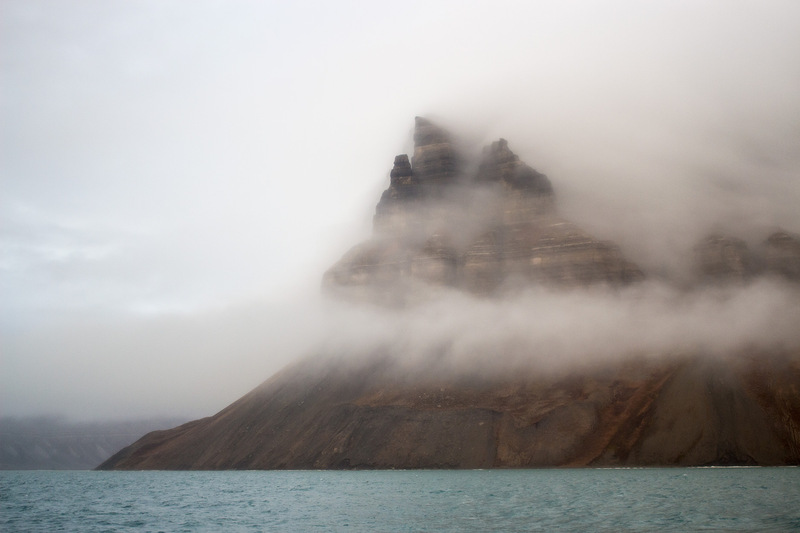 The clouds and the light around Svalbard were constantly changing – you could look at the same mountain for half an hour and catch sight of it in 30 different states! Eventually, late in the afternoon, we dropped anchor at a location called Gipsvika (above) from where we caught sight of some Svalbard reindeer traipsing across the landscape. From here we were able to make land at Gipshukodden. It was a fairly barren location . There was lots of flotsam and jetsam along the pebbled beach at which we landed providing some useful materials for some of the other artists with us. They took their pick of the rubbish and we did our best to clean up what we could of the rest. I wandered up the hill to where one of our guides was standing guard. At this spot were the remnants of a trap left by hunters. She estimated that it could have been as old as 100 years. With the temperatures being so cold throughout the most of the year the wood is, for the most part, frozen and so doesn’t suffer from decay! From the way in which our guide described how it worked, this otherwise innocuous collection of wood and stone would have been a rather brutal animal trap!